L: 56" x W: 18" x H: 35.5"
Zander Bedroom Dresser It's a youth bedroom, sure, but the Zander dresser offers timeless style that your child will love well into their teenage years. Every detail is included with looks and durability in mind—plank-look styling and an iron hardware finish lend a cool industrial vibe that complements a variety of decor. It's a youth bedroom, sure, but the Zander dresser offers timeless style that your child will love well into their teenage years. Every detail is included with looks and durability in mind—plank-look styling and an iron hardware finish lend a cool industrial vibe that complements a variety of decor. This is a well made beautiful piece with that being said the only issue I have is with the depth of the drawers. They are really deep so they hold alot but not wide enough to get to the bottom. I purchased this dresser 2 years ago for a 9 year old and it has been holding up. The quality and depth of the drawers are amazing. Its tall (height) and i hope he will have it for a very long time. Great dresser! My major concern with dressers are deep enough drawers and this dresser has 4 extra deep and 3 deep drawers. Quality is defintely good. I like the ease of how the drawers open and close. This was also important as this set was for a young child. I feel like this will hold up well through time. Color is true to pic and piping adds a boyish looks that will look nice through teenage years. This piece has good storage isn't that what you want in a dresser. The look of it is very easy on the eye. The color is dark and rich. Looked like the showroom model. The dresser we bought is a quality piece. A great addition to our home. We purchased this dresser not for a bedroom but as a storage chest for under our flat screen T.V- We use it to store everything from blankets to books!! Everything close by to lounge and watch T.V-Looks great! We love it!!! 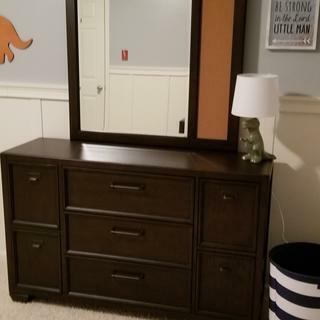 I bought this dresser for youngest son and daughter to share. The drawers are perfect and glide gently opened and closed. The deep drawers are good for organizing and separating items. The design is beautiful and the dresser is not too heavy! It is very practical and beautiful! The dresser is sturdy, heavy and seems to be well made. I love the deep drawers. Our only complaint is that the drawers don't open and close smoothly but I'm going that will improve over time. How do I get the nightstand drawer out? Is the dresser delivered already assembled? BEST ANSWER: Yes, our white glove delivery service includes assembly and set up in your home.